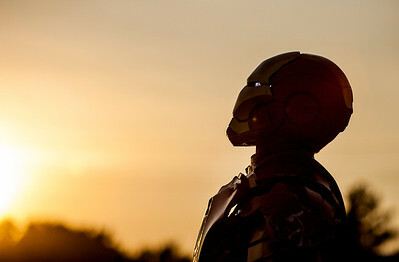 Kyle Grillot - kgrillot@shawmedia.com Trevor Walmer of South Beloit dressed as Iron Man stands in the sunset at the McHenry Outdoor Theater during Super Hero Night Saturday, August 24, 2013. More than a dozen superheroes from the Costumers with a Cause gather to raise money for the drive-in theater. 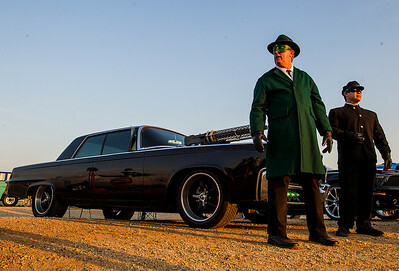 Kyle Grillot - kgrillot@shawmedia.com Kevin Skoglund of Kewanee dressed as the Green Hornet and Danny Lim of Galesburg dressed as Kato stand next to the Black Beauty car, one of many used in the making of the 2011 film, which was restored and modeled after the Green Hornet's original car during Super Hero Night at the McHenry Outdoor Theater Saturday, August 24, 2013. More than a dozen superheroes from the Costumers with a Cause gather to raise money for the drive-in theater. 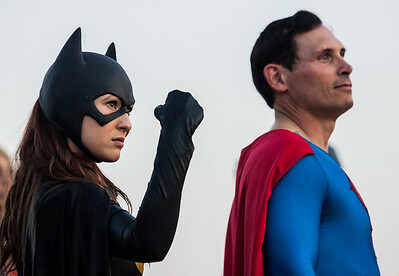 Kyle Grillot - kgrillot@shawmedia.com Amanda Hamil of Des Plaines poses for fans next to Scott Whipple of Aurora during Super Hero Night at the McHenry Outdoor Theater Saturday, August 24, 2013. More than a dozen superheroes from the Costumers with a Cause gather to raise money for the drive-in theater. Kyle Grillot - kgrillot@shawmedia.com Scott Whipple of Aurora (center right) laughs with other super heroes during Super Hero Night at the McHenry Outdoor Theater Saturday, August 24, 2013. More than a dozen superheroes from the Costumers with a Cause gather to raise money for the drive-in theater. 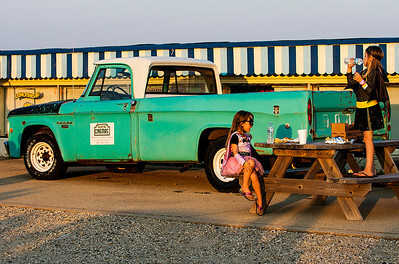 Kyle Grillot - kgrillot@shawmedia.com Breanna Grams, 5, eats with her sister Bridgette Grams, 8, both of Volvo next to a truck to be raffled off during Super Hero Night at the McHenry Outdoor Theater Saturday, August 24, 2013. More than a dozen superheroes from the Costumers with a Cause gather to raise money for the drive-in theater. Kyle Grillot - kgrillot@shawmedia.com Steven Schaffer hands food to his sons Logan Schaffer, 8, Justin Schaffer, 6, and Mason Argabright, 10, during Super Hero Night at the McHenry Outdoor Theater Saturday, August 24, 2013. More than a dozen superheroes from the Costumers with a Cause gather to raise money for the drive-in theater. 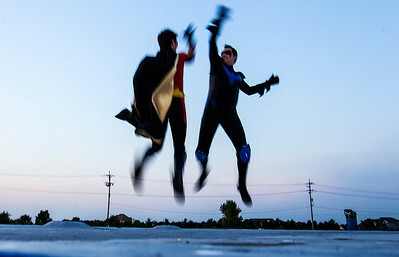 Kyle Grillot - kgrillot@shawmedia.com Jonathan Onopa dressed as Robbin and Dante Drake dressed as the Nightling both of Chicago high five on top of a building during Super Hero Night at the McHenry Outdoor Theater Saturday, August 24, 2013. More than a dozen superheroes from the Costumers with a Cause gather to raise money for the drive-in theater. Kyle Grillot - kgrillot@shawmedia.com Brad French of Chicago dressed as Batman's butler tips his hat at a fan during Super Hero Night at the McHenry Outdoor Theater Saturday, August 24, 2013. More than a dozen superheroes from the Costumers with a Cause gather to raise money for the drive-in theater. 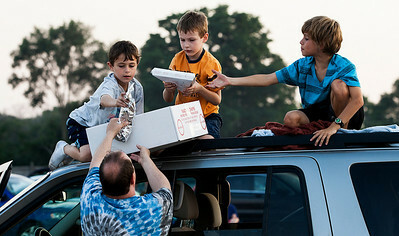 Steven Schaffer hands food to his sons Logan Schaffer, 8, Justin Schaffer, 6, and Mason Argabright, 10, during Super Hero Night at the McHenry Outdoor Theater Saturday, August 24, 2013. 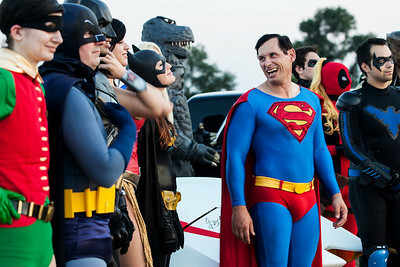 More than a dozen superheroes from the Costumers with a Cause gather to raise money for the drive-in theater.